Baking (Etc.) 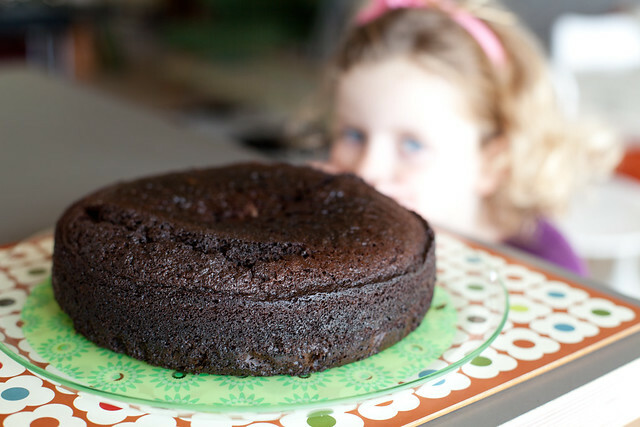 with David Lebovitz's "Ready for Dessert"
So far Racines is my favorite of the flourless chocolate cakes in the book. Frogprincess: It must be a chocolate festival at your house. I'm sure your neighbors are thrilled! I got this book not too long ago, after having had a tremendous time cooking from his "Perfect Scoop" (I have made a huge number of recipes from that book, with only one disappointment, and it was a recipe that he says he got from someone else). So far, I have had exceptional results from this book, with the two latest dishes--the Banana-Mocha Cake with Salted Caramel Peanuts and the Chocolate Crack Cookies--being particular standouts. This is a great book, and David is one of my go-to recipe writers. Neighbors, what neighbors?? Seriously, it's been quite a feast at our house and we are indeed very popular with our friends and neighbors. We all love chocolate so this book has been great so far. I've actually tried my first non-chocolate recipe from the book last week. It was the Orange Pound Cake. Pound cake can sound boring to some, but it's a great classic that is just perfect with coffee. This particular recipe had a great flavor thanks to the orange zest. I liked the fact that the glaze gave it an extra zing and kept it moist. Also the cake actually got better over time as the glaze permeated it. I made the Racines cake yesterday, it was a great chance to break into the bag of cocoa nibs I'd bought on an impulse when I saw them on sale at Whole Foods. It came out beautifully, almost looked just like the pic in the book, down to the crack in the center. I was expecting it to be denser, it was almost more like a baked mousse than an actual cake, but great. Not too sweet, lots of chocolatey goodness, and the cocoa nibs added just the right amount of contrast. I'm so excited to try out some of the other recipes! It's great to see Mr. Lebovitz posting here! It's comforting to know that if I seriously screw up a recipe, I might be able to get some feedback from the author on what I did wrong! I've been continuing the chocolate festival with a few other recipes from Ready for Dessert. The Chocolate Chips Cookies are great. They are chewy and the chocolate chunks melt when the cookies come out of the oven (I chopped semi-sweet chocolate bars). I made a couple of logs that I baked over a few days. I have a pretty good brownie recipe that I've been using for years but I decided to give Robert's Absolute Best Brownies a try. Well, I now have a new favorite brownie recipe. I was out of nuts so tried them with just the chocolate and I could not get enough of the wonderful texture and intense flavor. The real bonus for me is that it's a mess-free brownie that is easy to slice and doesn't fall apart. 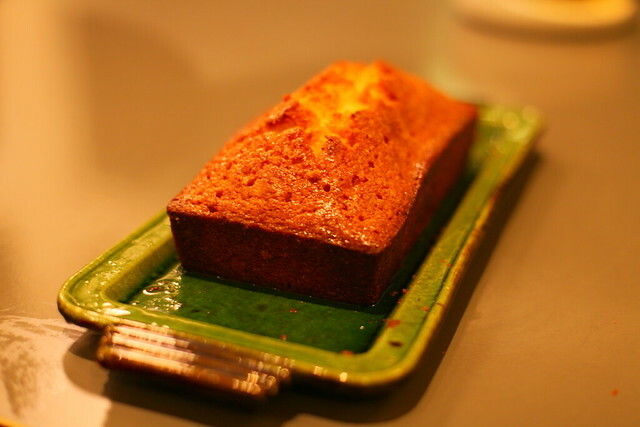 Lastly, the Fresh Ginger Cake does not contain any chocolate, but you could think that it does because of its rich flavor. I was a little nervous having never used molasses, and because of the relatively large amount of oil in the recipe. 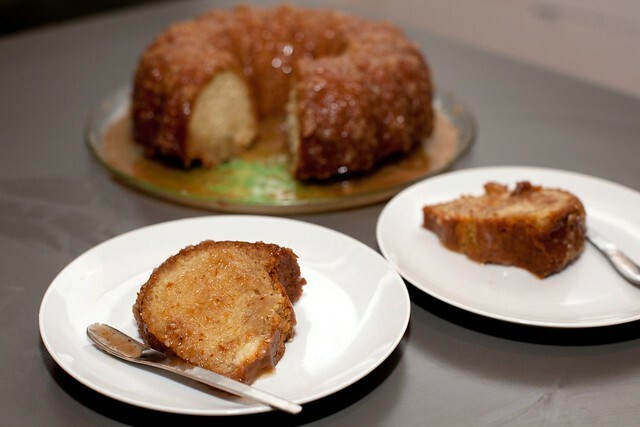 The cake is very moist and the fresh ginger flavor is obvious, with cinnamon in the background. Even my four-year old daughter, who claims not to like "spices", approved. I'm on a roll... I've made two more batches of the brownies, the chocolate pot de crème, and the Bahamian rum cake. The prep for Robert's Absolute Best brownies takes less than 20 minutes, only uses one pot, and bakes in ~ 25 min, so it's my new go-to recipe for last minute dessert requests. The chocolate pot de crème is another recipe that takes less than 20 min to prep, and bakes in about 35 min. It's all about the mouthfeel - a thick chocolate cream explosion. The Bahamian rum cake is a little more involved but really worth it. It's very moist and has a delicious flavor from the rum, coconut milk, and shredded coconut. I made the chocolate financiers (almond cakes) from The Sweet Life in Paris, Delicious Adventures in the World's Most Glorious - and Perplexing - City. The book is a hilarious read by the way, with great, and unfortunately very correct, observations of the typical tribulations of living in Paris. I started with my prep at about 10:30 pm, and by 11 pm we had a batch of delicious little cakes. Financiers can be a little dense or dry but these were neither. I love chocolate and I preferred these to the traditional version. I've tried more recipes from Ready for Desserts since my last post. It seems to be my go-to dessert book at the moment. These were a departure from my usual truffle recipe because they were a multi-step affair with several very messy steps (at least for me) especially the rolling and dipping part. But it was really worth the (minor) trouble. They were intense with a wonderful texture. I served them at the end of the Easter meal. Blondies (which disappeared before I could take a picture). 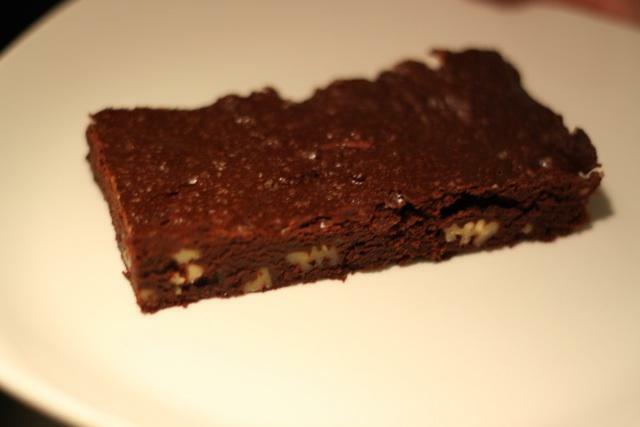 Similar to the brownies, in that they are really fast to make. I did not let the batter cool down properly before adding the chocolate chips, so they bled a little into the cake. But that did not really matter, there were still distinctive chips in the end and the blondies were delicious. This is a simple butter cookie flavored with cocoa powder. They were a little less snappy than what I would have thought based on their name, not that it really mattered. They are great with tea. It was my inaugural recipe for my new Kitchenaid stand mixer! These have to be amongst the most delicious cookies I've had a chance to try. They have a light and crumbly texture thanks to the almond powder, and an intense chocolate flavor, almost like a brownie. They really deserve their name. It's my new favorite recipe from the book! Have you ever tried freezing the Chocolate Idiot Cake, or keeping it a wee bit past 5 days? I made it last night to check out my oven (which has been temperamental lately), thinking if it didn't work out, I'd still have a few days to try again. But it turned out perfectly, and if I can, I'd like to keep it till Friday (which would mean keeping it for 6 days). The Chocolate Spice Bread from The Sweet Life in Paris. This twist on the French pain d'épices is intensely flavored with chocolate, plus the traditional ingredients: honey, cinnamon, ginger, cloves, and whole anise seeds. It's a little dense (in a good way) and really good with coffee. I did not have anise so I used fennel seeds instead. I don't think that I am able to tell the difference in a cake. I was going through pictures and realized I had forgotten to post a few to this thread. I agree with you, the Racines cake is truly exceptional. I don't think that I could survive without chocolate in the house. My husband and daughter would never allow this to happen. We are all chocolate addicts in case this was not already obvious! Moving on to winter desserts with the Butternut Squash Pie. A couple of weeks ago, I got a confection squash, a type of kabocha squash, in my CSA that I needed to use. I had already made squash soup, so I decided to make a squash pie for a change. Kabocha is quite close to butternut in taste. The squash was baked in the oven and then mixed with a blend of spices that is similar to the blend used for the chocolate spice bread (cinnamon, ginger, cloves, nutmeg, and some black pepper). Heavy cream, milk, eggs and brown sugar are added to complete the filling. Two other ingredients, vanilla extract and Cognac which I have not seen in other squash pie recipes, really round up the flavor. My yield was way too large and, in addition to a 9-inch pie, I was able to make two small individual pies, and could easily have made a third one if I had not run out of pastry dough. 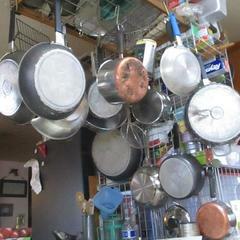 Note that I am using French tart pans which are not very deep, and may explain my "problem". Another minor issue had to do with the pie dough. I baked it blind with weights first, and then without the weights. Usually I poke it with a fork so it does not attempt to escape from the pan. I did not do this and ended up with a large bubble. The pie was very flavorful. We ate it cold with some whipped cream. Squash pie is nice but I can never get enough chocolate. So I made the Chocolate Pavé from Ready for Dessert this weekend. It's a fairly light chocolate cake that is cut into rectangular pieces, like paving stones (pavés). I made sure not to overcook it and it was ready after only about 25 minutes in the oven. The recipe says to dip a fork in chocolate to create abstract patterns on the cake. My melted chocolate was very thick, so this was really impossible. I ended up adding water to the chocolate. 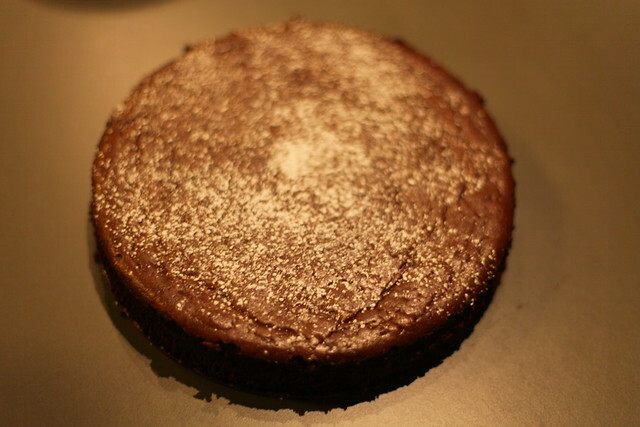 The cake looks a little "rustic", but that's probably ok for a dessert that was created at Chez Panisse. It tasted very good and was not dense as pavé cakes can sometimes be. Looks good, FrogPincesse, especially with the creme anglais. Last week I had a pound of dates that I was trying to find a use for. I found a recipe for a Date-Nut Torte in Ready for Desserts, not something I would usually go for. But since I had all the ingredients, I decided to give it a try. My dates were very sweet and sticky (a good thing for dates), so it was a little hard to get them not to stick together as a giant mass. I followed his advice to use a little flour which helped. These were local Medjool dates. I've been having a hard time finding anise seeds so I substituted fennel seeds. The recipe has the particularity of not containing any eggs. Here is the cake ready to be baked. After baking. The top became a little crispy which gave the torte a nice texture. The first bite hit me as incredibly sweet and rich (maybe I should have reduced the amount of sugar a little since my dates were so sweet). But then the taste really grew on me. I found they were perfect cut into small pieces and enjoyed with coffee. It's time to post about my latest baking adventure with David Lebovitz. During a trip to Paris earlier this year, I went to the excellent baking supply store G. Detou and picked up a giant bag of "sucre perlé", aka beaded sugar, with the idea to make chouquettes, which are little sugar puffs. Six months later, the bag of sugar was still languishing unopened in my pantry, so I decided to give it a go. Having had success with gougères last year, I realized that chouquettes were just a sweet version of the same thing. The recipe I chose was from The Sweet Life in Paris, Chocolate Chip Chouquettes. What I like about this recipe is that it's a one-pot recipe which is extremely simple. The most involved part was making sure that the chouquettes were completely covered in pearl sugar before baking them. Also chouquettes are special to me because they remind me of my great grandmother who used to buy them on Sundays as a special treat. I had not had them in years since you never see them in bakeries here (not even French bakeries). Here they are before going into the oven. Here they are out of the oven, nicely caramelized. They are great as is, and best the day of. The next day, they make a great vehicle for ice cream, for a delicious twist on profiteroles. I tried David Lebovitz's banana bread/cake from his website. The little back specks are cocoa nibs. There is also a touch of cinnamon. It's very moist and not dense or overly sweet as some recipes are. Excellent with a cup of coffee. I had super-ripe bananas that I needed to use so I made the banana bread again. I still love it. My daughter prefers the version with chocolate chips but I like the crunch and subtle chocolate notes of the cocoa nibs. When I make ice cream with egg yolks I always look for good recipes using egg whites. Also I realized that I had bought way too much almonds by mistake and needed to use them. I've made financiers and macarons so far, but recently I found another gem, the Croquants from Ready for Desserts. I was very skeptical at first. The batter of egg whites + flour + sugar was very thin and I could not picture what these cookies were going to look like in the end (the book does not have a photo). But I decided to trust David Lebovitz and I was amazed when I saw them rising in the oven. They were little crunchy delights. Light and crisp, with a toasted almond flavor. Outstanding with a cup of espresso! That looks like an excellent use of eggwhites. Yes - how to make something great with practically nothing. I love this kind of recipes. So, what is everyone doing for the pastry & baking side of Easter? I'm working on the following chocolates: fruit & nut eggs, hollow bunnies, Jelly Belly filled bunnies, coconut bunnies, dragons (filled with rice krispies & chocolate), peanut butter hedgehogs, and malted milk hens. Hoping to finish my dark chocolate production today and get started on all my milk chocolate items. My father-in-law will be baking the traditional family Easter bread a day or two before Easter. Its an enriched bread and he makes two versions -- one with raisins and one without (I prefer the one with raisins). I’m trying to find a recipe to make caramel suitable for varegating or swirling into Ice cream when the ice cream is loaded out of the ice cream maker to the ice cream storage container. When swirled at this stage it crams a nice caramel swirl when dipping. I have made several attempts, first attempt tasted great but got stringy and difficult to cut with a spoon. If you wanted to you could pull it out like a Spiders web. A typical caramel sauce will just disappear into the ice cream and seems to break down into the ice cream. Another attempt it got very sandy when cold and had to be hot to be dispensed into the ice cream, causing the base to melt away. Most useable commercial products seem to be heavy with corn syrup. I have tried that without success. Somehow I think that might be the key since the ingredient list for commercial caramel Variegate has it as the first ingredient and sweetened condensed milk the second item. Appreciate any recipes or formulas for a Variegating caramel creme ripple you might be able to offer or your suggestions. A mistake was made with my Albert Uster order this week and I received it twice. Since it's shipped from CA, doesn't go bad, and I'll use it eventually, I'm not going to mess with trying to return the second delivery. But now I have a huge amount of inventory so I thought I'd see if anyone here was looking for Felchlin by the bag. As for shipping, I can fit 2 bags in a medium flat rate box for $14 or 3 bags in a large box for $19 to go anywhere in the USA. If you'd like some, PM me with your selection, email, and shipping address. I'll invoice you via Square and you can pay securely online with a credit card. @Smithy Your request gave me the imputes to finally word-process the recipe. My DW use Excel, which drives me to distraction. edges together and making sure top crust is vented. Bake at 425F for 15 minutes, then turn down oven to 350F for about 45 minutes. I dont believe that any English translation of Carêmes works exist. An incomplete version was published in 1842 (I think) but even the that version seems lackluster for the few recipes it does cover. I think it's time the world looks to its past, but I don't speak great French and it's a huge task to undertake. I hopefully plan on publishing this work and anyone who helps me will get a very fair cut, and if we decide not to publish it, I'll put it out on the internet for free. I'm working in Google docs so we can collaborate. I'm first cataloging the index to cross reference the pre-existing incomplete English version to give us a reference of what yet needs to be done, and from there we will go down the list of recipies and Translate them one by one. Simple google translate goes only so far, as it is 1700s French culinary terms and phrases being used. I'd like to preserve as much of Carêmes beautiful and flowery language as possible. Who's with me?